I am trying to find out more about this doll, with painted on boots, with number 800 on them. I can't find any other marking. It is really in good shape. I got it at a thrift store because it was so cute. It may not be worth anything, but I wanted to see if I could find out more about it. You could go on dollreference.com, but you don't have a lot of information here. 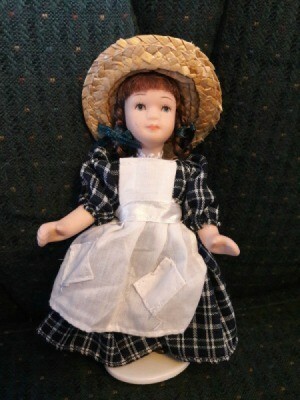 You could also take the doll to an antique shop and see what they say. i would search through the doll books at the library. Considering the information provided and also the photo, I would tend to think this is an inexpensive mass produced doll that may not be branded in any manner. 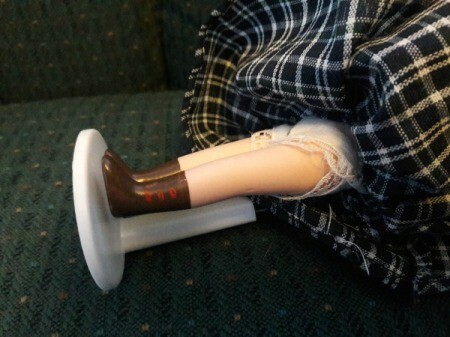 Photo shows no individual fingers (closed hand) and painted on shoes which are indicative of mass produced (China, etc) dolls that may not have a "family" name. Many similar dolls are sold at Christmas time. This is only a guess as it might be a different case if the doll was an older doll. I agree that she is cute and if you have a special place to display - name her and - enjoy.